A decade and a half or so ago, I was very interested in Hermetism, (Christian) Kabbalah and the like. I travelled to the Amsterdam Bibliotheca Philosophica Hermetica (or Ritman Library) every once in a while. That has been quite a while. Some time ago I wondered if the library would have publications that I do not have yet and I noticed this book about Johannes Reuchlin (1455-1522). Wondering why I never came to get it (or why I did not visit the exhibition!) I got this well-printed book for only € 10,-. Actually it is an exhibition catalogue, but at the BPH, a catalogue is never just a dry summing up of the items on display. The book is about A4 in size and counts just over 100 pages. As with other BPH exhibition catalogues, there is a lot of information in the book. From the book you can learn how Reuchlin was in contact with people such as Marcilio Ficino, Pico della Mirandola, Johannes Trithemius and many more of the interesting people of his time. Pico acquainted Reuchlin with the Kabbalah and he had yet another branch to add to his quickly growing library. Hebrew books, and Kabbalistic books in particular, were very hard to find in these days. There is quite a bit of focus on Reuchlin’s role in the situation of the forbidding of Jewish books. He had a standpoint that brought him quite a bit of trouble. He did not want all Jewish books destroyed. You will also learn about Reuchlin’s library and what happened to the books after he passed (most were only destroyed during WWII! ), what else he wrote about and how his works inspired people who came after him. You will not learn too much about his Kabbalistic ideas though. 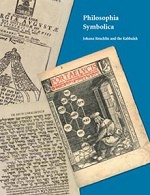 Like I said, the book is actually the catalogue of an exhibition that the BPH had on Reuchlin in 2005/6 to celebrate the 550th anniversary of his birth. The BPH has a massive collection of ancient esoteric books, many originals and first or early prints. Still they had some works come from other libraries for this exhibition. The items on display included works of Ficino, Pico, Eusebius, Pythagoras, Agrippa, Trithemius, Gikatilla, Khunrath, Böhme and Fludd. Of course many works of Reuchlin himself were displayed. Each displayed item gets a shorter or longer explanation. There are not a whole lot of images in the catalogue (too bad), but the catalogue makes a very nice read about an interesting person living in an interesting time.